Ibanez are a company that needs very little introduction. They are well known for producing electric guitars for some of the World’s best guitar players, but they don’t tend to get much acknowledgement for their very good acoustic guitars. This is a shame because they really do make some nice looking and, more importantly, great sounding acoustic guitars at very reasonable prices. 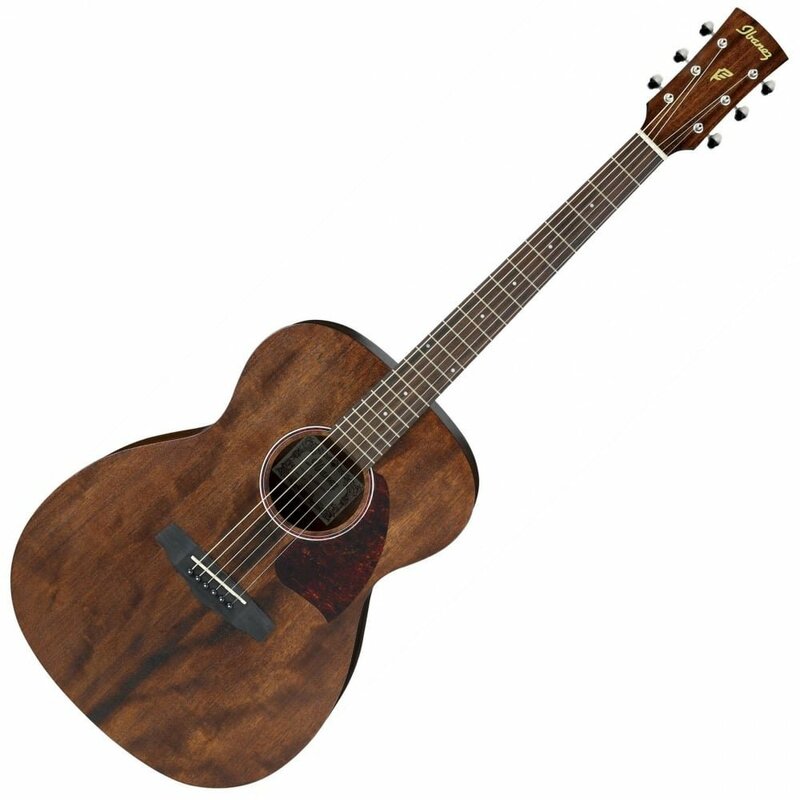 If you are looking for a good quality budget acoustic guitar then I can guarantee that Ibanez will have something to meet your requirements. the Ibanez PC12MH-OPN is well worth a look. What can you expect from the Ibanez PC12MH-OPN? The guitar top, back and sides is made from African Mahogany. Now the purists amongst you will say that it is a bit of a cheat to call the wood African Mahogany because the use of the word mahogany indicates the guitar is made from an expensive tone wood. Now rather than disappear off into a rather convoluted story on what constitutes true Mahogany I will just say that African Mahogany is a cost effective tone wood which is not considered to be genuine mahogany. That aside the look of the guitar with the African Mahogany is beautiful. This is even more so with its open pore natural finish which really suits the wood and also the feel of this guitar. The Ibanez PC12MH-OPN is described as a Grand Concert size guitar. That is it’s a full size guitar but it is not as big as a Dreadnought. But what does that mean? Well in terms of size the Grand Concert is a little slimmer than a Dreadnought which is ideal if you are just starting out as you don’t feel that you have to over extend your arm to strum the guitar. The Ibanez PC12MH-OPN has a mahogany neck with a 20 fret rosewood fretboard which is a delight to play. For me the natural finish makes for a smooth playing experience up and down the neck. The only drawback of the Ibanez PC12MH-OPN is that it doesn’t have a cut-away to allow easy access to the upper frets. However, that is a relatively minor negative point in what is an impressive instrument. The tuners are standard three aside chrome open gear tuners with butterbean knobs. The chrome look really suits this guitar and they worked well with an easy tuning action. The bridge is rosewood with Ibanez pins to keep the strings in place. So this is all very impressive so far with a top quality spec and excellent attention to detail and build quality, which is certainly good considering the price of the guitar. How does the Ibanez PC12MH-OPN play? Out of the box the guitar is ready to play. The action, the height of the strings from the fretboard, is just about right which means you don’t have to fight to hold the strings down and there is no discernible fret buzz. The neck is very comfortable to play and the frets are all rounded off nicely. Tone wise the Ibanez PC12MH-OPN is a pleasant surprise with a decent mellow sound with plenty of definition and resonance. All in all this is a very good sounding guitar. To sum up when looking for a budget starter guitar you need something that is going to be playable, sounds good and looks the business. There are some guitars that do one of these and others that do none. The Ibanez PC12MH-OPN does all of these things and more so for me is an ideal choice for a starter acoustic guitar. If you like the look of the Ibanez PC12MH-OPN then check out the latest price of this amazing guitar on Amazon. If you are looking for more ideas on a budget acoustic guitar then check out our article budget acoustic guitars you’ll want to play where we review some great value acoustic guitars. Are guitar starter packs any good?